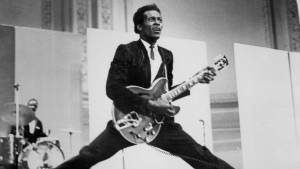 The man often looked to as the originator of rock ‘n’ roll, Chuck Berry, died today at the age of 90. The singer-songwriter and guitar legend–best known for deathless rock numbers like “Johnny B. Goode”, “Maybelline”, “Roll Over Beethoven”, “Memphis”, and “Nadine”–died this afternoon, St. Charles County Police Department confirmed. The cause of death was not revealed. Born in St. Louis, Missouri, Berry had his first #1 hit in the U.S. in 1955 with “Maybelline”, which was adapted from the 1938 Western Swing fiddle tune “Ida Red,” by Bob Wills and his Texas Playboys. It was released as a single–with “Wee Wee Hours” as the B-side–by Chess Records, which became synonymous for Berry’s best-known songs in the fifties and ’60s. Posted in Music, R&R History for 200 Mr Trebek, Sherry Carroll.